Waller Hugh Paton, Entrance to the Cuiraing, Skye, 1873. Oil on canvas: 111.80 x 162.60 cm. Scottish National Gallery. EDINBURGH.- The Scottish National Gallery announces two important acquisitions to the national collection. Entrance to the Cuiraing, Skye (1873) by Waller Hugh Paton (1828-1895) has been purchased for the collection by the Patrons of the National Galleries of Scotland and Portrait of JeanFrançois Regnault (1815) by Jean-Baptiste, baron Regnault (1754-1829) has been acquired for the nation thanks to the generosity of a private donor. Entrance to the Cuiraing, Skye (1873) by Waller Hugh Paton, was purchased from Bourne Fine Art in Edinburgh with the generous support of the Patrons of the National Galleries of Scotland. Scotlands most prolific and successful Pre-Raphaelite landscape painter was previously not represented in the national collection of Scottish art by a single oil  an omission which the Gallery has been seeking to rectify for almost ten years. 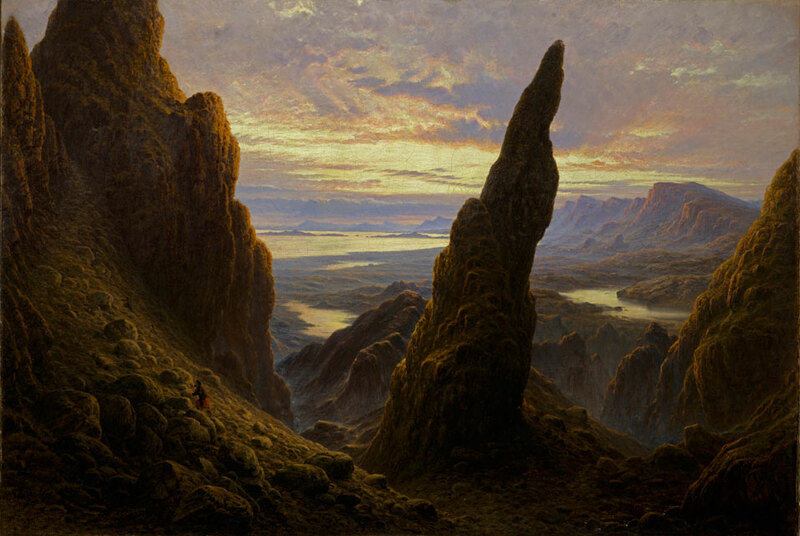 Completed in 1873, this spectacular example of Patons mature landscape painting also strengthens very substantially the pictorial representation of the Highlands throughout the National Galleries and is the most important view of Skye in the Scottish National Gallery apart from J M W Turners exceptional watercolour of Loch Coruisk (1831), conceived as an illustration to The Lord of the Isles by Sir Walter Scott. Like his older brother Sir Joseph Noel Paton, who is internationally known for his fairy pictures illustrating A Midsummer Nights Dream, Waller Hugh Paton began his professional career in Dunfermline, designing damask patterns for his father. At the age of 20, having resolved to become a landscape painter, he sought tuition in watercolour from John Adam Houston RSA, but was otherwise mainly self-taught. From 1851 Paton exhibited annually at the Royal Scottish Academy where he became conspicuous for his distinctive and peculiar scheme of colour with purple hills and orange skies flecked with rosy clouds and for his high finish and minuteness of detail reflecting his adoption of Pre-Raphaelite aesthetics and working practices. Of the Quiraing on the Trotternish peninsula, Paton recalled that it was an awful place. The power of that memory is enshrined in his vision of three tiny kilted figures toiling up the boulder-strewn slopes on the left of the picture. This figure is almost indiscernible at first glance and completely dwarfed by an apocalyptic and other-worldly panorama of the northern Skye hills and by a sense of time immemorial embodied in the bizarre rock formations dominated by The Needle in the foreground. Yet, by the 1860s, Paton was just one of the many visitors embarking on the Oban excursion steamer for Skye, where the photographer, with his camera and chemicals was almost permanently encamped at Loch Coruisk, the hills sit for their portraits, and the hill sheep dislodged stones upon unsuspecting artists and tourists scrambling up the Quiraing in quest of the sublime and the terrible. Regnault had three sons, each of whom enjoyed distinguished military careers. A proud father, he painted military portraits of all three of them in 1815. The painting acquired by the Gallery is of the second son, Jean-François (known as Francesco to his friends). He is shown wearing the uniform of a captain of the 3e régiment de tirailleurs (3rd Rifle Regiment) with the Légion dhonneur pinned to his chest and bearing the scar on his forehead, depicted at his insistence, of a wound from a sabre cut sustained at the siege of Astorga in Spain in 1811.